There's an old saying that the moon is made of green cheese. Of course, that came from a time when people didn't really know what the moon is made of. 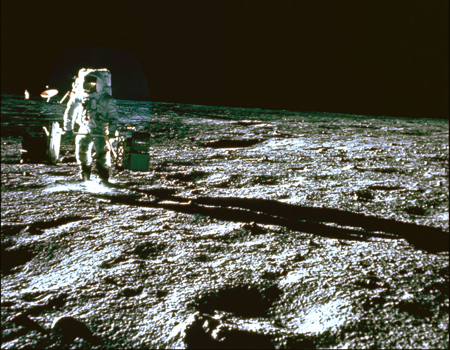 Scientists have learned a lot about the moon in the last fifty years. Most importantly, we've even traveled to the moon and collected a sample of some of that green cheese. You know what they found? It's not made of cheese at all! It's made out of rock. Scientists have theorized about the origin of the moon for centuries, and many implausible theories abound. But there is one very plausible explanation about the birth of the moon, which not only answers where it came from, but explains the earth and moon's rotation and current orbit. Called the Big Impact Theory, it states that the moon was created when another celestial body about the size of mars crashed into the earth. It was such a cataclysmic event that the earth swallowed up the body that crashed into it, absorbing it into its own mass and increasing it to its current size. Another major side effect of the collision was the ejection of a large chunk of earth's rock which was sent into orbit around the earth, becoming its moon. The rocks that were collected from the moon have been studied extensively for their mineral composition. Examination of "moon soil" samples (called regolith) have revealed some strikingly similarities to earth's geology. Rocks made of basalt from volcanic eruptions and minerals, such as plagioclase feldspar and olivine, are exactly the kinds of rocks we find here on earth. In striking contrast to the true soils that we have here on earth, there are no organic materials in moon dust. Organic materials come from the breakdown of living things, such as trees and animals. Since there's nothing living on the moon, the soil is not a true soil like we're used to here. It's gray with very fine grained particles like sand or even dust and extremely dry because there is no water on the moon. (Although scientists have theorized that there is water ice trapped in the polar regions of the moon). Because the moon has no atmosphere to protect it from solar wind, molecules (like hydrogen, helium, neon, carbon and nitrogen) from the sun impact the moon's surface directly and are implanted into mineral grains. Scientists estimate that about 50% of the moon's surface composition is oxygen, bound up in silicate minerals! Have you ever looked up at the full moon and seen what looks like a face? You're not alone, as humans throughout history have also gazed at the very same moon and seen that same face. Because of its rotation and orbit we have always seen the same side of the moon, the side with the face. The dark markings on the moon come from large basins on the surface that were created when other space objects (meteors and asteroids) crashed into the moon billions of years ago. The "eyes" of the face even have names; the right eye is the Imbrue basin, and the left eye is the Serenitatis basin. The rest of the features aren't quite as clearly "drawn", such as a nose and mouth, but most people would agree that the moon appears to be watching us. We always see the same side of the moon. The moon rotates on its axis while orbiting the earth; it just does one rotation on its axis for each revolution it makes around the earth, so it keeps the same side facing the earth. There's an old saying calling the back side of the moon (the side we never see) the "dark side of the moon", but that's not really true. The next time you see a "new moon", remember the dark side of the moon is getting all of the light, we just don't see it from earth. The moon is more than just a really cool night light for the sky. The gravitational pull of the moon actually bulges the water in the oceans out from the earth's surface toward the moon. The gravitational pull on the side of the earth opposite the moon is not as strong so the oceans unbulge on that side. This constant push and pull tug-of-war with the oceans by the moon is what causes the tides at the beach. So the next time you find yourself standing on a full, moonlight night on the beach, think about the moon trying to pull the water out of the ocean! If you want to find out exactly what time high and low tides will be for a certain beach you plan on visiting check out the NOAA's Tide Predictor page.